GST accumulations in January rose to Rs 1.02 lakh crore - the second most astounding month to month wipe up after April, the back service said Saturday. This is a critical increment from the gathering of Rs 94,725 crore in December 2018, and 14 percent higher than January 2018 accumulation of Rs 89,825 crore. 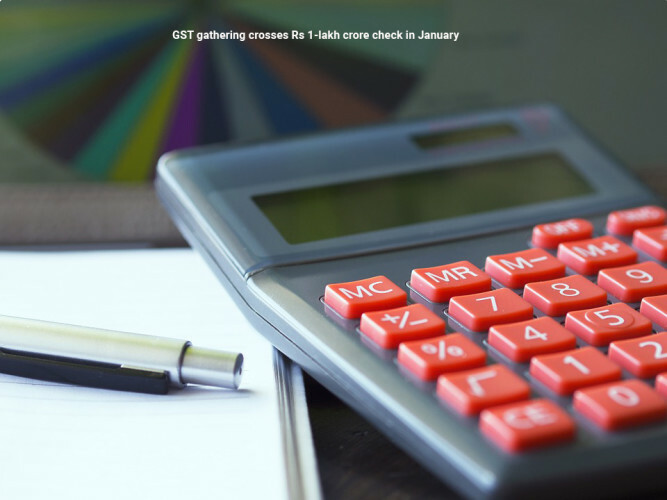 The all out number of offers return or GSTR-3B petitioned for the long stretch of December up to January 31, 2019 is 73.3 lakh. "The all out gross GST income gathered in January 2019 is Rs 1,02,503 crore of which Central GST is Rs 17,763 crore, State GST (SGST) is Rs 24,826 crore, Integrated GST (IGST) is Rs 51,225 crore and Cess is Rs 8,690 crore," the service said in an announcement. This is the third time in current financial that incomes from Goods and Services Tax (GST) have crossed Rs 1 - lakh crore stamp. In April and October as well, the accumulations outperformed this achievement. The administration has settled Rs 18,344 crore to CGST and Rs 14,677 crore to SGST from IGST as customary settlement. The complete income earned by the focal government and state governments after ordinary settlement in December 2018 is Rs 36,107 crore for CGST and Rs 39,503 crore for SGST. GST accumulation remained at Rs 1.03 lakh crore in April, Rs 94,016 crore in May, Rs 95,610 crore in June, Rs 96,483 crore in July, Rs 93,960 crore in August, Rs 94,442 crore in September, Rs 1,00,710 crore in October, Rs 97,637 crore in November and Rs 94,725 crore in December 2018.